According to a report posted to the Western Massachusets Indymedia site, local police maced and physically assaulted people protesting the presence of military recruiters at Holyoke Community College. The crowd of more than fifty did not back down from the half-dozen cops and ultimately forced the National Guard recruiters to pack up and leave. 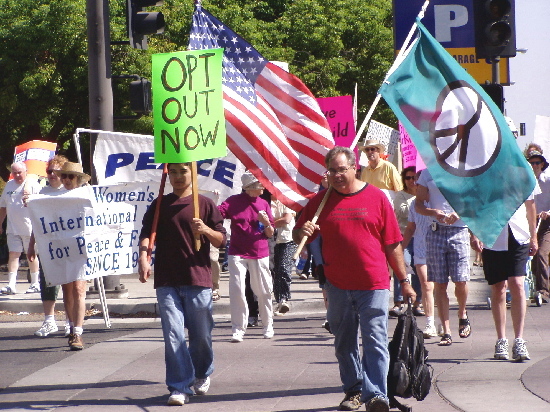 The protest was organized by the Anti-War Coalition, a local chapter of the Campus Antiwar Network. The post asks people to register their sentiments about the police activity by calling the school at 413-538-7000. The Defense Department has a new ad campaign, extensively described in a massive New York Times article today. It encourages children and parents to talk about enlisting, in a new strategy targetted at "influencers," possibly in response to the recent decline of parental support for joining the armed forces. The camera tracks a mother's field of vision as she hovers over a checkbook and a calculator lying on her kitchen table. She looks up as her daughter, a young African-American woman, sits down to speak with her. "Look Mom, if I decide I still want to be a doctor when I get out, I'll have had four years experience as a nurse or an X-ray tech or an O.T. specialist working with real patients," the daughter says, speaking directly into the camera and into her mother's eyes. "That's why I want to enlist in the military; it'll be good for my career. What do you think? Mom?" The campaign is scheduled to launch on October 17th, and seeks to fight the dwindling numbers of new recruits, as the war in Iraq and around the world drags on. It's designed by a Massachusetts ad agency, Mullen, whose other clients include Eastman Chemical and General Motors. "This is advertising that is designed not to look or feel like advertising at all," Edward Boches, chief creative officer at Mullen told the Times. The Times article also notes that the Army's ad spending "has almost doubled since 2000, to about $290 million this year, according to Army data," and that the Army "expects to spend at least $1 billion on marketing under a five-year contract that it plans to award sometime this winter." "... I can't for the life of me figure out how this upcoming campaign made it out of focus group. 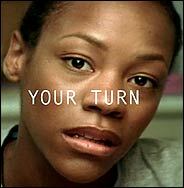 The first thing that came to mind when I saw this image from one commercial was "It's your turn . . . to die." I mean, they might as well put target lines around this woman's face! Considering that the number one reason young people don't sign up for the military is to avoid getting killed, I give this campaign a week before it's shot down." Even the Times agrees that the DOD has a hard job ahead. In the coming months, the article ends, "the Army's marketing and recruitment machine will be challenged to prove wrong the old joke that even the best ads cannot sell a troubled product. "I think people in the armed services are racking their brains to come up with new recruiting messages," Professor Segal [a sociologist at the University of Maryland] said. "But I don't know that they've come up with anything that's worked." "Ten U.S. Army recruiters are offering volunteer help for Katrina evacuees at Houston's Astrodome. But the recruiters, struggling to keep enlistment up during Iraq war, are also available with options for the jobless. "Our intent is to approach the evacuees at the right time for them,'' says Army spokesman Douglas Smith." The toddlers were at the pizza parlor to celebrate Kristina's 3rd birthday. A dozen youngsters jumped and clapped their hands as a giant rat, Chuck E. Cheese, came out to greet them. The Iraq War was far from my mind. If you have never been to Chuck E. Cheese, it is a mix of carnival and play park, with so-so pizza, lots of video games, coin operated kiddie rides, and arcade games like ski ball. When the birthday party settled into eating pizza and birthday cake... a series of large screen TVs came to life to show Chuck E. Cheese TV. The program was, at first, MTV-like. Performers in large animal garb sang and danced through an idyllic scene with herons and alligators. A man clad in a blazing yellow shirt and red vest skipped across the screen, singing and snapping his fingers to the lively music. The scene shifted to a person dressed in a dog costume fishing in the lake with 3- and 4-year-old children and then shifted again from pictures of the children to mothers holding small babies. Although it was disjointed and a bit crazed, it was what one might expect at Chuck E Cheese. Then my jaw dropped: the MTV segment shifted to a promotional piece compiled by the Department of Defense! The promo showed happy, smiling soldiers in Iraq handing out toys and candies to delighted children. This was followed by a series of scenes showing war planes, tanks and more happy soldiers. This production lasted for 5 minutes of the 15-minute CEC TV show. Throughout the segment, the large animated puppets' eyes shifted toward the TV as they nodded in approval and clapped. Then their eyes shifted back to the children, who were spellbound by the movie. Several telephone calls I made to Chuck E. Cheese headquarters were not answered. Finally reaching someone at the local outlet, one of over 500 company owned and operated locations, I learned that the CEC TV show was a regular part of the offerings at all CEC sites and that it was run a number of times during each day. I was stunned. Chuck E. Cheese, a place for 3-year-olds to have a birthday party, was playing promo films for military recruitment to the babies and their "youngish" parents! The problems with military recruiting in high school and middle school have been well documented, but now the Pentagon is targeting an even younger group! By Bryan G. Pfeifer, via Milwaukee Indymedia: On August 25 the Milwaukee School Board voted to increase awareness in the school district and provide more information to parents about the “opt-out” provision in the “No Child Left Behind” act. The administration also pledged to review the activities of the military recruiters...It will now be up to the counter-recruitment movement to hold the board accountable and to see to it that real action is taken.